The Rev. 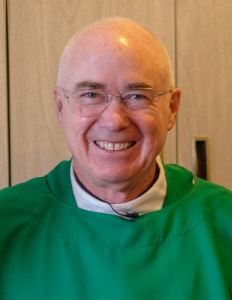 Hugh Cleary, C.S.C., began his time in the Holy Cross religious order as a novice here in 1965 and by 1998 had been voted the order's superior general and led the entire world-wide congregation from the headquarters in Rome, a post he held for two six-year terms until 2010. "I remember my first time in Rome, right after the election for (superior general), we had a Mass in Pope John Paul II's private chapel," Cleary said in a recent interview. "I was standing next to him and had part of the Mass in Latin, and I had never said the Mass in Latin. So I was afraid 'as soon as he hears my Latin, he'll be sending me back to the States.'" He laughed as he said this. After 12 years in Rome, Cleary eventually found himself a year ago back in Bennington. He serves as an associate priest to the Rev. Bob Wiseman, C.S.C. at Sacred Heart St. Francis de Sales Parish in Bennington and St. John the Baptist Church in North Bennington. Basically his role is as "your regular parish priest — visiting people in the hospital, visiting them at home, offering any counseling people might like, spiritual direction," he said. "It's a good life, a full life and very enjoyable. I'm very happy to be here." He is now helping to lead a local evangelization effort to offer fallen-away Catholics a chance to return to practicing the faith. Cleary is originally from Queens in New York City. "I always wanted to be a priest since I can remember. I was in the Brooklyn Diocese growing up so I thought I'd be a priest there," he said. He went to the Holy Cross Brothers high school in New York and one of the brothers suggested that he join Holy Cross. As noted above, he went through his beginning period in the religious order — known as the novitiate — in Bennington in 1965-1966. The novitiate was where Southern Vermont College is now. "It was great. I loved it here," he said. "Coming from New York City, first time I'd ever seen a farm. We had about 35 milking cows, going in there you tip-toed around the manure and then after a while, after a couple of weeks, you're just slushing through it all. Everything was fine, you know." After his beginning period in Vermont, he went to seminary at Stonehill College in Massachusetts. "It's a coed college but we had a seminary on the corner of the campus," he said. He then went to Notre Dame University for theology studies. He was ordained in 1973. After a parish assignment in Massachusetts, he served as pastor for 10 years of an inner-city parish, Our Lady of Good Counsel, in the Bedford-Stuyvesant area of Brooklyn. After this period of parish work, Cleary went on sabbatical and earned a PhD in formative spirituality from Duquesne University. There he studied with the Rev. Adrian Van Kaam, who was famous for combining psychology and spirituality, integrating the two of them, and who founded Institute of Formative Spirituality at Duquesne. "I suppose because of that background I was asked to be the novice director, and by that time we had left Bennington, and now it was in Colorado," Cleary said of the novitiate. "So I went from the mountains of Bennington to the mountains of Colorado. And that was a great experience for me." He was serving as novice master when he was elected in 1994 as superior of the Eastern Province of the Priests in the United States. In 1998, he was elected superior general of the Congregation of Holy Cross, the eleventh in the order's history. The first superior general and founder was Basile Moreau, who served in this position from 1857 to 1866. The third superior general, Edward Sorin, C.S.C., in 1842 established with companions what would become the University of Notre Dame. The congregation has a presence in the United States, Canada, Mexico and Haiti; in Europe in France and Italy; in South America in Brazil, Chile and Peru; in Africa in Ghana, Kenya, Tanzania and Uganda; and in Asia in Bangladesh, India, and the Philippines. As superior general, Cleary visited Holy Cross sites and he would frequently give retreats during his visits. "It was very inspiring to see all of this ministry that Holy Cross was doing," he said. "When we were established we were founded in France, came over to the United States and Canada as mission territory — like Notre Dame originally was a school for the Indians and the French settlers. And so we've always gone to very poor areas, like Haiti and Bangladesh. "I was in Haiti after the earthquake and I remember saying I would never complain again," he said. "But then I was back in the states for a couple of days and I was already complaining." According to the order's website, his work in office also included restructuring the congregation, issuing circular letters calling the community back to the basic values of religious life, and developing a solidarity fund and an international finance committee to share the congregation's resources more equitably and to build a congregational perspective. After leaving office in 2010, before coming to Bennington in 2016, Cleary's ministries have included serving as chaplain at the retirement house of the Sisters of the Holy Cross in Ventura, Calif.; as director of campus ministry at Stonehill College in Massachusetts; and as national director of Holy Cross Family Ministries in the United States. In Bennington, his approach to being a priest is simple and direct, "I think right now my basic approach is just to love the people, which is very easy to do. I find the people here just terrific — everybody's so warm and friendly and welcoming. I just felt made at home immediately," he said. In his spare time he loves jogging and hiking, he said. Cleary said there are now two committees of parishioners of Sacred Heart St. Francis de Sales and St. John the Baptist working out an approach for evangelization — reaching out to promote the faith, particularly to Catholics who have drifted away. The idea is "how do we welcome people back to the church who were Catholic and then have dropped off for various reasons. How can we reach out to them?" He added, "We want to find the middle ground where people will feel welcome and look to their faith again as to give them meaning and purpose in life or renewal in life — and as something that's very good and healthy and something that's going to be enriching for them." Citing an old cornflakes commercial, Cleary suggested trying faith again as if for the very first time, "because we all have a desire in us, an emptiness within us that we're trying to fill and nothing really fulfills it except for God. And so how do we start getting in touch with that God again who loves us so deeply?" We're in a time of so many choices, distractions and a wider disorder in life. "Maybe some people were disillusioned with religion, but now is the time we can all get disillusioned with everything else that's taken its place," Cleary said. "There's so much chaos. And I think we want to say, 'well, what is really the glue of life?' And really the glue of life is God's love."